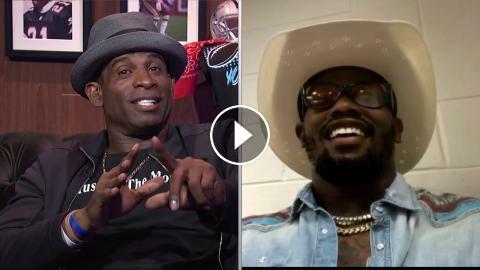 ﻿ Von Miller to Deion Sanders: "This Broncos team is special"
Von Miller to Deion Sanders: "This Broncos team is special"
Deion Sanders: "I feel like Jaguars are having an identity crisis - who are they?!" Deion Sanders: "If Packers can make it to the playoffs, anything is possible"
Deion Sanders to Adam Vinatieri: "There's no argument, you are the GOAT"
Deion Sanders on Odell Beckham's comments: "That's not right!" Deion Sanders on Marcus Peters: "He wanted & desired to be somewhere that he's more comfortable"
Deion Sanders: "Steelers can't keep tolerating Big Ben's slow starts"
Deion Sanders on 3rd quarter benching: "I feel sorry for Jameis Winston"
Deion Sanders: "Rams have won this offseason, even if they do nothing else"
Deion Sanders on Vikings loss to Saints: "Why aren't they running?!" Deion Sanders: "Khalil Mack is the MVP right now, he's given the Bears hope & defense dominance"
Deion Sanders on quarterbacks getting $100M deals: "I don't like it one bit"
Deion Sanders reacts to fan saying he can't tackle: "I tackled yo mama"